Sorry, Guitar Hero: We still love you, but we think it’s time we started seeing other franchises. Opting for a full band setup in Guitar Hero World Tour was a smart move and adding all those convenient features like Party Play to Guitar Hero 5 made all kinds of sense, but this time, it’s just not enough. Your ridiculous new story-driven career mode fails to hide the fact that Warriors of Rock is essentially just a dressed up version of the same game we’ve been playing for years. If anything, Quest Mode feels like the easy way out. Rather than providing a legitimately fresh new experience, it simply attempts to distract us with cutscenes and a Gene Simmons voiceover. But underneath the cheesy, occasionally fun but ultimately uninspired and forgettable adventure, we’re still forced to slog through a linear progression of songs, earning enough stars to unlock the next venue and so on just like most of the other Guitar Heroes. There’s nothing wrong with this formula per se, except for that fact that we’re pretty sick of it at this point. It doesn’t help that the good old five-button, scrolling note gameplay hasn’t changed even slightly since… well, ever. The gameplay is still fun, (because it’s the same and it’s always been fun), but that’s a bit of a hollow victory when you’re hungry for actual change. The only apparent difference this time around—in keeping with the whole rock ‘n’ roll fantasy adventure theme—is that each characters possesses a unique power, like a 6x multiplier (as opposed to the usual 4x) or the ability to harvest Star Power with every 10-note streak played. This sounds like a fine idea in theory, but in practice, it doesn’t change the experience in any meaningful way and most of the powers feel totally contrived. More than anything else, the powers serve to create confusion. In past games, the maximum number of stars we could possibly earn from a single song was six. Now, thanks to these powers, we can potentially earn dozens. But since stars are just a completely made up measurement, this doesn’t actually feel rewarding at all. Add to that the fact that the stars we earn in Quest Mode are entirely separate from those we earn in quickplay (which, fun aside, actually has two distinct types of stars of its own) and we just start to get massively confused. 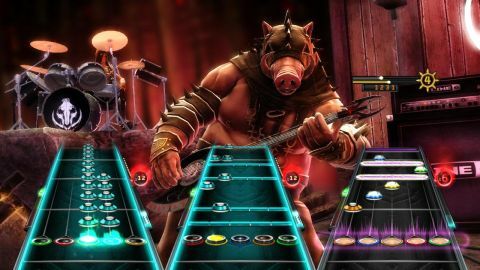 The 14th Guitar Hero game in less than five years arrives this fall, touting a new controller and quest mode as the primary additions.